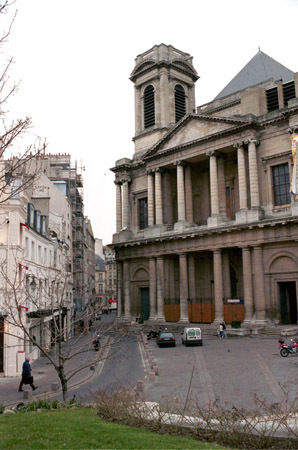 This monumental church, near the Forum des Halles, was built between 1532 and 1637. 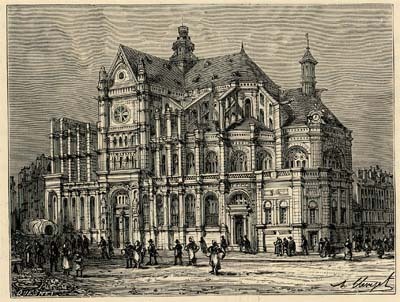 It provided an ideal setting for the performance of large-scale choral works, and it is appropriate that over a period of nearly thirty years three of Berlioz’s major choral compositions, his Messe solennelle, Requiem, and Te Deum were performed there, all of them under his direction. The reference is to the cantata La Mort d’Orphée which Berlioz had composed the previous summer for the Prix de Rome competition. As for the Mass, Berlioz eventually became dissatisfied with it (his discovery of the music of Beethoven a few months later may have contributed to this reassessment); he discarded the work but re-used some of the music in other compositions, and in particular the Requiem and the Te Deum: the early Messe solennelle was thus a precursor of these two works of his maturity. Berlioz’s monumental Requiem (the Grande messe des morts) received in all only five complete performances in the composer’s lifetime, all of them in Paris except for an enterprising performance in St Petersburg under Heinrich Romberg in 1841. 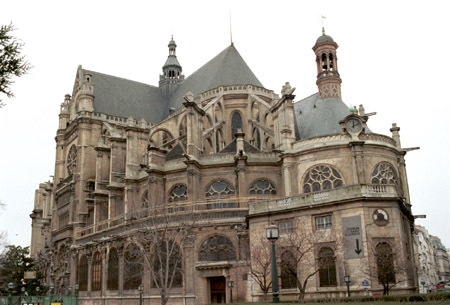 The first performance of the work took place at Les Invalides in 1837 under the direction of Habeneck; all three subsequent performances were conducted by Berlioz himself and had as setting the monumental church of Saint-Eustache. In all three cases the performances were organised for a special commemorative purpose. 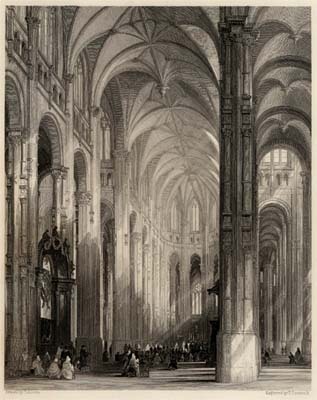 Less is known about the second performance at Saint-Eustache, on 3 May 1850, held in support of the families of victims killed by the collapse of a bridge at Angers. 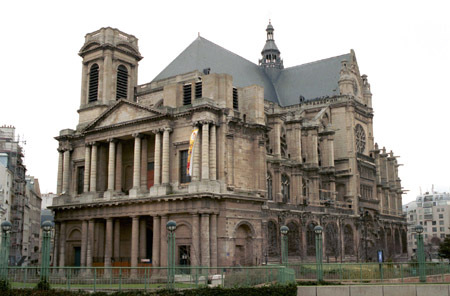 The concert was given with the orchestra and chorus of the Société Philharmonique which Berlioz had founded earlier in the year (further details on the performance are provided in that page). Berlioz’s letters give information on the preparations for the concert (CG nos. 1321-4, 1325, and [vol. 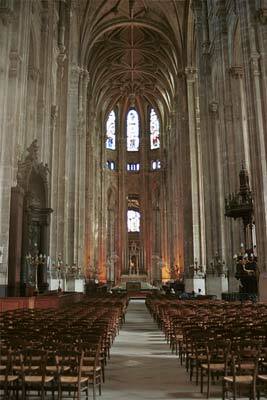 VIII] 1322bis, 1322ter, 1327bis), but no account of the performance has survived from his pen; the reason is probably that it came the day before the death of his sister Nanci after a long illness. 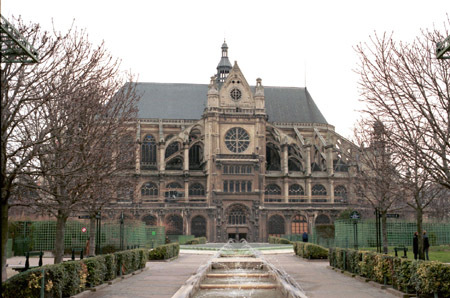 As he writes to his other sister Adèle, ‘Fate willed that the day before our sister died I was busy at St Eustache with the performance of my Requiem. Is that not a sad and strange coincidence?…’ (CG no. 1331, 15 May). […] I have been feeling rather uncomfortable since Friday, as a result of the emotions aroused by the Requiem. You have never missed such an opportunity to hear my work. It was colossal! We were nearly 600, I had an amphitheatre constructed in the choir to raise my choristers, and the effect was all the better. The whole of elegant Paris was present, the Institut was there, as were the famous artists in every genre, and a dense crowd. I had the satisfaction of seeing many people weep. The day before this ceremony the director of the Opéra tried to prevent all the personnel of his theatre from participating, and Baron Taylor, our president, tried in vain to make him reverse this stupid decision taken purely against me. I then informed the minister of the Interior who immediately sent to the honourable Roqueplan an order to display at the Opéra a notice intimating that the ban had been lifted. This rebuff administered to this gentleman gave added spice to the success I scored the day after. Besides, all the artists were determined to come in spite of the ban. This is causing a great stir. This funeral mass was being celebrated for the peace of Baron de Trémont’s soul; he has just bequeathed his entire fortune to the artists. Despite what Berlioz says in this letter, the Journal des Débats went on to make handsome amends: on 23 November it went on to publish a long and enthusiastic review of the performance, written by J.-E. Duchesne, a friend and admirer of Berlioz. In a letter to his sister Adèle, late in November, Berlioz described the review as ‘the finest analysis that has yet been written of my Requiem’ (CG no. 1537). The review is reproduced in full on this site. 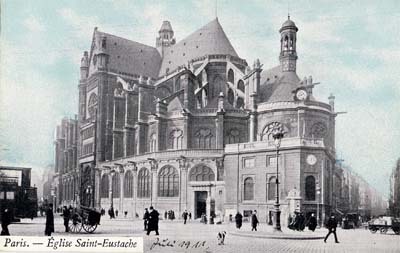 I did not write to you on the day of our great business at Saint-Eustache nor the day after; I was too tired and exhausted. I thought I was about to fall seriously ill.
Today I am better. Let me therefore tell you that this enormous ceremony, which attracted an immense crowd, has also made the most immense impression. There was a moment of emotion so great that in one corner of the church applause broke out, though it was quickly suppressed. It was colossal, I assure you; I now know that my Requiem has a brother (the Te Deum) and a brother that is worthy of him. 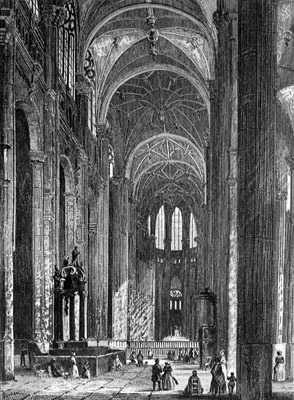 I cannot describe to you the sight of this vast cathedral, so magnificently decked out at the moment, with my orchestra filling the choir, my choristers the cross of the nave, and these 800 children on a vast amphitheatre which rose up to a height of two storeys. Neither can I say anything to you about the majesty of this immense duet between us and the organ that was singing mysteriously at the other end of the church. See also the review of the performance published shortly after by Edmond Viel in Le Ménestrel. All the modern photographs reproduced on this page were taken by Michel Austin in 2002; the 19th century engravings and the postcard are from our own collection. © Monir Tayeb and Michel Austin. All rights of reproduction reserved. 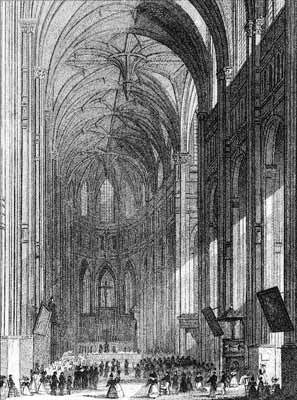 This is an 1830 engraving showing the nave, scanned from A. Pugin’s book Paris and its Environs, published in London in 1831, in our collection. The above engraving was published in a book entitled Les Églises de Paris (Paris, 1843), a copy of which is in our own collection. 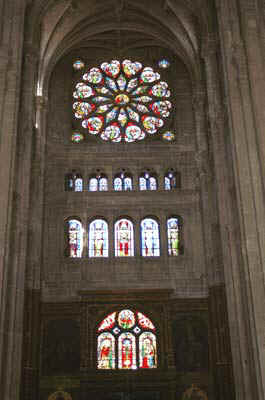 At the première of the Te Deum the orchestra, ‘the Emperor’, and the choruses were placed at the altar end of the nave. 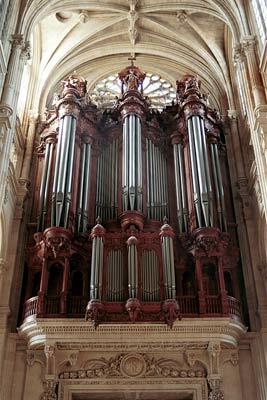 This is the organ, ‘the Pope’, which entered into dialogue with Berlioz’s orchestra at the première of the Te Deum.